Parkland School Shooting Commission Calls For Code Red Alarms And Bleeding Control Kits A Florida state commission has issued a draft report into the school shooting in Parkland earlier this year. Its suggested policy changes may be considered by schools across the country. 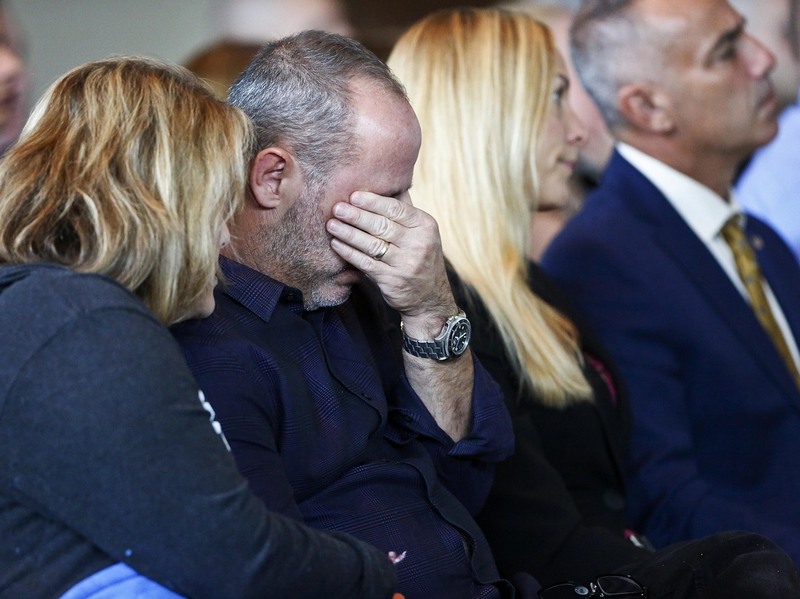 Fred Guttenberg, whose daughter, Jaime, was killed in the Parkland, Florida, school shooting last February, cries while his wife Jennifer comforts him during a state commission meeting Thursday, Nov. 15, 2018. As the nation's eyes were on Broward County, Florida, for a flawed, week long election recount, a state commission a few miles away was investigating the county government's role in the Feb. 14 massacre at a Parkland high school. It found that failed leadership, inconsistent or unenforced policies, and misinformation contributed to the 17 deaths. The Marjory Stoneman Douglas High School Public Safety Commission — a panel created by the Florida Legislature that includes parents of slain students — met for four days last week in Sunrise. The commission is chaired by another county's sheriff. It reviewed a presentation of more than 600 slides detailing what law enforcement officers did practically every second after confessed killer Nikolas Cruz fired the first shots at the school. It is now crafting a report with recommended actions for preventing the next school shooting, a document that's likely to be considered by education leaders around the country. Among the commission's findings: The Broward Sheriff's Office deputy assigned to the school hid for nearly an hour rather than going into the building where the shooter had started gunning down 14 students and three staff members. It also found that police wasted precious minutes before advancing to the third floor of the building, where ten people had been shot and six of them would die. That's because surveillance footage, delayed by 26 minutes, made them believe the gunman was still in the building when he had already fled. The sheriff's office captain who directed the on-the-scene response appeared to be in a "trance" and "over her head" that day, and she has since resigned. And the highly criticized sheriff, Scott Israel, defended his agency's policy that cops "may" — not "shall" — enter an active assailant situation, which gave some deputies cover when they hid behind trees and cars rather than advancing into the school. The most dramatic moment during the commission's marathon meeting was the unexpected no-show of the disgraced former school cop, Scot Peterson, who hid in a stairwell during the shooting. Peterson's lawyer appeared briefly to inform the panel that his client was suing the commission, fighting the subpoena compelling him to appear. As the lawyer, Joe DiRuzzo, left the hearing, the father of a murdered teen confronted him. "He didn't do his job," Fred Guttenberg told DiRuzzo, adding that his 14-year-old daughter, Jaime, might not be dead if he had. "For him not to face these families, for him not to face this community, shows what a coward he is, how pathetic he is," said state Sen. Lauren Book, a Broward County Democrat and the only state lawmaker on the panel. "And we're going to continue to work to get to the bottom of it." Members said they might try to hold Peterson in contempt of court. Meanwhile, Peterson launched a brief attempt to solicit donations for his legal bills, asking for $150,000 through a GoFundMe campaign that attracted critical comments from parents and community members, but no money. It was eventually taken down. Peterson isn't the only one who's been ducking requests to testify before the commission. For months, chair Bob Gualtieri, the sheriff in Pinellas County, has been pushing for a representative of the FBI to testify about why the agency mishandled two tips warning that Cruz might shoot up a school. Initially, Gualtieri believed a representative would testify in September or October. But he said he heard recently that no one would be coming, and instead the agency would be sending a packet of information detailing its own internal investigation into what happened. Asked for an update this week, a spokesperson for the Florida Department of Law Enforcement, which oversees the commission, emailed that: "To our knowledge, the commission has not received anything from the FBI." Another sheriff and member of the commission, Polk County's Grady Judd, speculated that the FBI's unwillingness to testify could mean the results of the internal investigation don't reflect well on the agency. "If they had done everything perfectly, they would have been up here with a band," Judd said during Friday's meeting. At one point commission member Max Schachter, whose son Alex was killed, tearfully thanked Gualtieri and other investigators for their detailed work. "Ever since this happened, the only thing the 17 families have wanted was to find out the truth and some accountability," Schachter said. "Because of you, I think we're going to get that." The commission plans to meet once more before the Jan. 1 deadline for its report to the newly elected governor and legislature, which will include recommendations for policy changes. Education leaders around the country are likely to consider implementing them, as districts try to prevent shootings, but also prepare for the possibility that the next massacre could be in their schools. The group has published a draft report with suggested changes and will discuss them in more detail during meetings next month. "Hard corners": In the draft report, the commission recommends marking off so-called "hard corners" in every classroom and keeping them free of furniture or objects that can't be easily moved. "Hard corners," also referred to in the report as "safe zones," are areas where students can hide and not be seen by someone looking through or shooting through a classroom door window. The commission found that as least one Marjory Stoneman Douglas High student was killed because she couldn't fit into a "hard corner." Code red policies: According to the report, all public, charter and private K-12 schools should have policies for responding to active assailants, including protocols for code red drills and lockdowns. The commission suggests requiring that schools install audible alarms that sound throughout campuses in the event of a code red. In Parkland, Cruz's gunfire triggered fire alarms, which sent students into hallways instead of in hiding. The draft also recommends that all school employees have the ability to call a code red and lock down a school remotely. No "floater" security guards: A state law passed after the Parkland shooting requires a police officer or an armed security guard on every school campus. But the commission found that some districts are using "floater" officers who spend part of the day at one school and part at another. The commission suggests the law should be clarified to make sure such guards are present during all school hours, writing that "no school is to be left unattended." More money for arming school staff: The Florida Legislature offered a one-time $67 million allocation for arming and training school staff as security in the current state budget. The commission is asking lawmakers to up that investment and make it recurring. Real-time monitored surveillance cameras: The commission wants a mandate that school districts allow law enforcement live access to surveillance cameras during emergencies. Another recommendation is for schools to enhance their current surveillance systems so there are no gaps in camera coverage inside or outside school buildings. Police and medical first responders wasted time on Feb. 14 because they were watching delayed footage and believed the shooter was still in the school building. Advocacy for student privacy law changes: The commission also wants state lawmakers to work with Florida's congressional delegation to lobby for changes to federal student privacy laws. Members' hope is that school districts would be able to share more information about students with law enforcement. Currently, the Broward school district is citing student privacy laws in its refusal to grant law enforcement access to cameras in schools.